The Scottish trip in February saw us heading to Glen Clova in the southern Cairngorms, keen to make the most of a good forecast and hopefully some great conditions. Axes and crampons were sharpened, skis dusted off and way too much food packed as we made our way to the newly refurbished Braedownie hut, which is owned by the Carn Dearg MC. A few keen members had gone up early to try and get an extra day in. 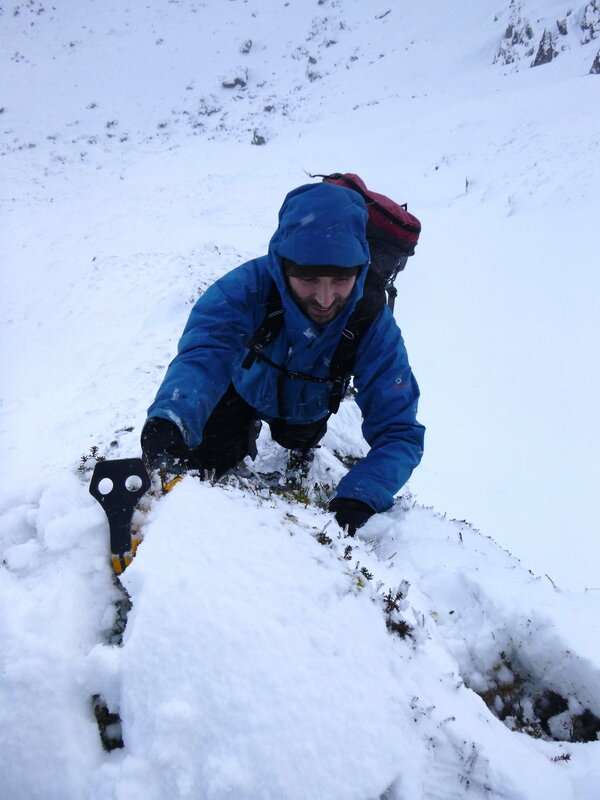 On Friday Paul and Jamie took the gear for a walk up Corrie Fee, sadly the conditions weren't quite as good as hoped, and all the gullies looked a "bit deathy" (Jamie's words! 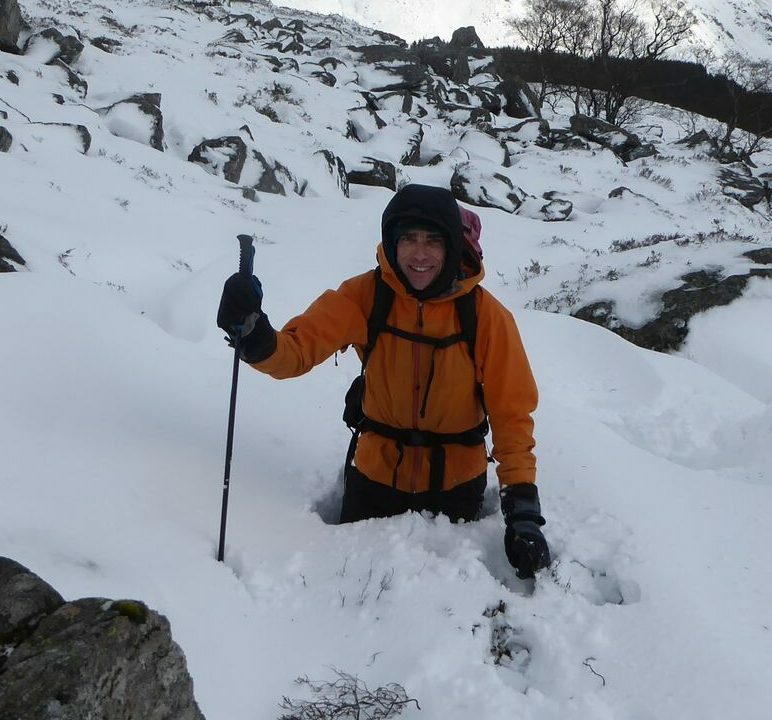 ), so they followed Simon and Carmen up the buttress of Craig Rennet (deep, soft snow and heather). Rob takes up the story for Saturday: "After much discussion and lots of delays while waiting for the rain to stop, Jamie, Paul, Rob, Dave, Russ, Dan and Peri headed off towards Winter Corrie in the light drizzle. The Walk in is quite straightforward and takes a little over an hour. 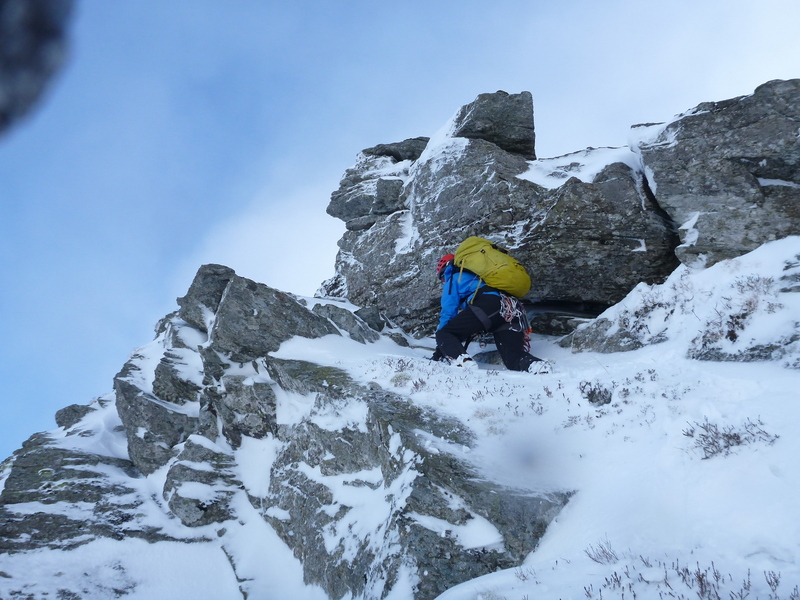 We were greeted with a view of much snow and huge cornices overhanging the main buttresses. The line of Diagonal Gully did appear to have lots of ice on it but we decided against it. Peri retreated back to the hut before taking a stroll to Corrie Fee, the rest of us made our way to the centre of the Corrie and had a lunch break by the huge boulder. We picked a route up the eastern (less loaded) slopes which was cornice free and with rocks to join up in a route to the rim. We all trudged up, put our crampons on before tackling a few rock steps on the way to the top. Dan ran laps around various bits of the slope with a huge grin on his face. We topped out in calm, bright sunshine and blue skies and were rewarded with wonderful panoramic views. The team then plodded to Driesh summit and hid by the trig point before splitting up. Paul, Jamie and Dave route marched over to Mayar and down the Kilbo path. 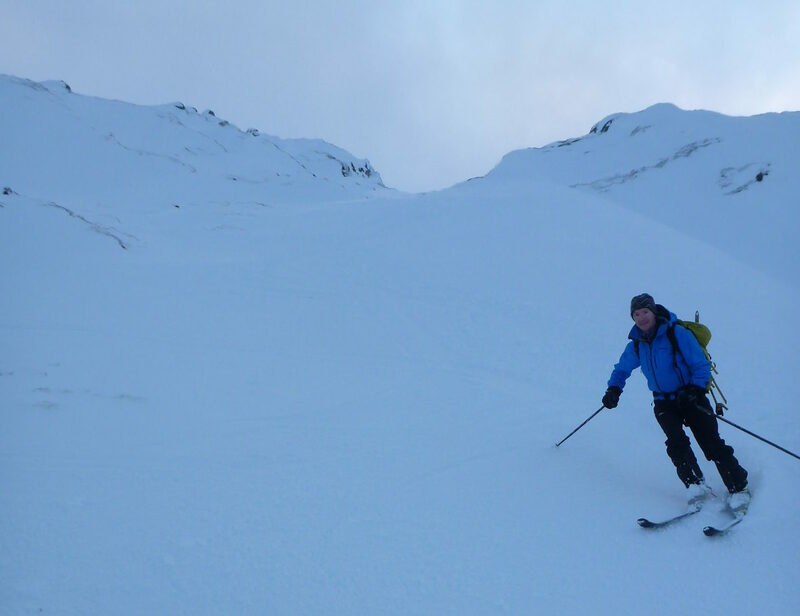 Rob Dan and Russ navved back to the corrie and descended the spur, which was occasionally eventful with deep snow and large patches. At the bottom, they crossed the style of doom and the found the bridge which made a short walk back to the hut". 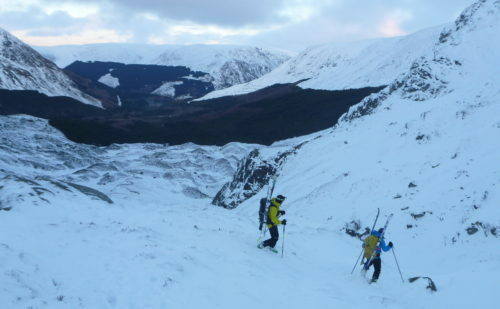 While they were all playing in Winter corrie, another group of 6 headed further on to Corrie Fee to have a look. Again this was found to be powdery and unconsolidated, although everyone managed a route of some kind, sticking well clear of the unstable looking gullies. 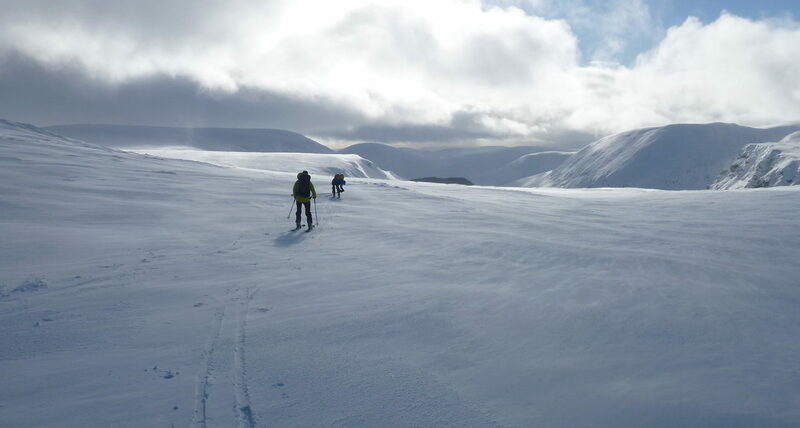 After ascending the left hand side buttress, Richard and Pete continued over the plateau to the Munros of Mayar (928m) and Driesh (947m) in the sunshine, with some great sastrugi patterns to admire on the way across. 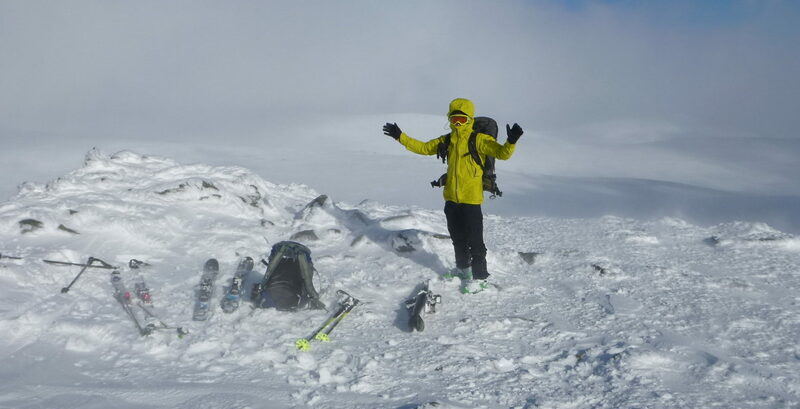 Jamie: "On Sunday, being pretty knackered and thoroughly sick of carrying a big sack, I went for a wee run in the snow, telling Paul I'd be back in an hour, which turned out to be 13km, climbed to over 700m (at the shelter) and took 2h15m. Only out by 125%!" . Pete, Mike and Richard having seen the cracking conditions on the plateau the day before were keen to get the skis out and head up for a day tour. After boot-packing up Glen Doll they popped the skis on at the forest edge and skinned up Jock's road past the emergency shelter to tick off their first munro on ski (Tolmount, 958m). The tour continued over the Munro Tom Buidhe (957m) as the viz came and went in the strong wind, and then the cloud came down properly, resulting in some challenging navigation to get off the plateau. Turns out trying to estimate how far you've travelled and contouring on skis is pretty tricky! Sadly they couldn't do the best downhill ski sections justice in the white out, and found their way down corrie fee before hiking back through the forest to the hut. Monday was the day to travel home, and with a poor forecast most were planning short trips out before hitting the road. 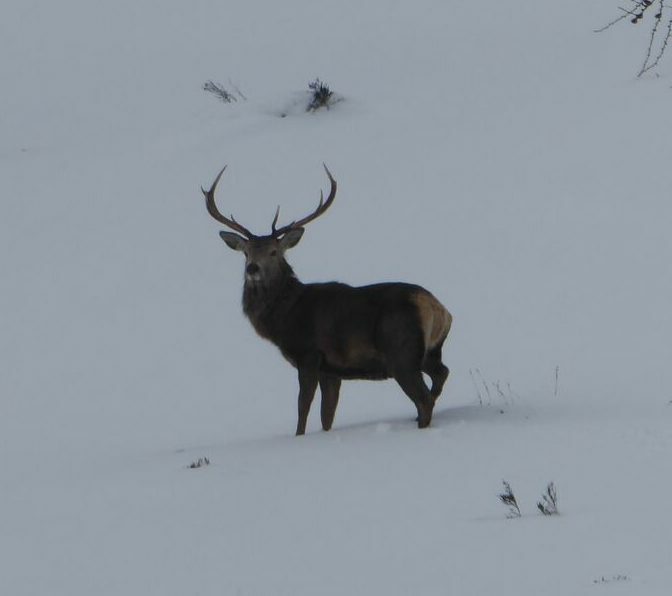 This resulted in a pleasant group walk up to Loch Brandy from the valley bottom behind the hotel. Some carried on to the Corbett 'The Goet' (Ben Tirran) unfortunately no views to reward them, but they did find a bothy to eat lunch out of the weather. Peri went for a 'powder swim' up driesh in an 'epic' amount of snow following fresh falls overnight getting some fabulous views before the clag blew in. Apologies I don't have a record of what everyone got up to, but all agreed it was a great weekend of winter adventures, hanging out in the mountains with friends, and of course calorie loading YAC style!